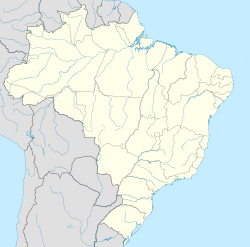 Jacupiranga is a municipality in the state of São Paulo in Brazil. The population is 17,851 (2015 est.) in an area of 704 km². The elevation is 33 m.
The municipality contains part of the 182,596 hectares (451,200 acres) Rio Turvo State Park, created in 2008. This page was last edited on 24 January 2017, at 02:53 (UTC).